History of the Mediterranean Bronze Age – or when was the Minoan eruption of Thera? The question about the exact date of the Minoan eruption of the Thera (Santorini) volcano, which ended the Minoan culture and left impressions on the archaeology of the whole eastern Mediterranean, is still enigmatic. While archaeologists seem to favor an eruption date around -1500 (the so called "low" chronology), other scientists want to place the eruption around -1620 (the "high" chronology) i.e. about 120 years earlier, because of radiocarbon dates and tree ring and ice core evidence. There is still a hot debate running about this topic (refs.1,2), and a recent article by Felix Höflmayer may illustrate the case (ref.3). However, concerning one point the archaeologists seem to have reached consensus: the Minoan eruption took place around the start of the Egyptian New Kingdom, i.e. the start of the 18th dynasty. 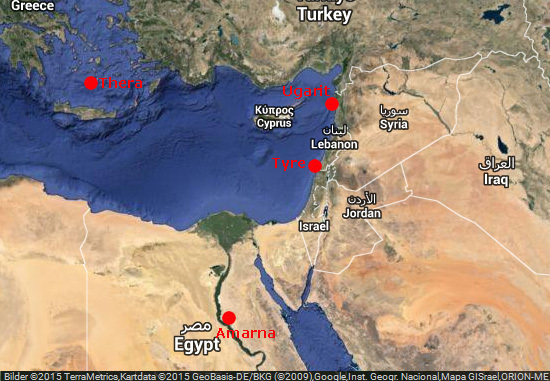 Therefore a reliable date of the Minoan eruption would pin down the Egyptian New Kingdom on the absolute time line. Many articles have been written about the radiocarbon dating of samples from the Thera eruption and the Egyptian 18th dynasty. We do not want to discuss the radiocarbon results here, as the resolution of this dating method appears to be so low that it was not capable to detect dendrochronological errors as large as 200 years, if we are right (read more here). A peculiarity related to the Minoan eruption/start of the 18th dynasty question is that the Thera samples have radiocarbon dates around -1620 (where the proponents of the "high" chronology want it), while the early 18th dynasty samples have radiocarbon dates around -1550 (where the archaeologists want it). 70 years radiocarbon offset is quite a lot for two events which are archaeologically regarded as contemporary. In a recent article by Ritner and Moeller (ref.4), Ahmose's "Tempest stela" is interpreted as a contemporary record of the cataclysmic Thera event. Ahmose was the first ruler of the Egyptian 18th dynasty. He erected the Tempest stela in Thebes to commemorate a very heavy storm which had devastated Egypt, and to describe the restoration work ordered by him. However, other scholars see the Thera eruption later in the 18th dynasty around -1500 (which would increase the radiocarbon offset even more). Volcanism affects climate which affects tree growth. Therefore a lot of work has been directed at finding "volcano markers" in long tree ring width chronologies. LaMarche and Hirschboeck (ref.5) detected frost damage to the cells of high elevation bristlecone pines which already had started growing for the spring/summer season. They were able to connect some of these severe frost throw-backs to volcanic cooling events in historical times. It appeared to be only one frost damage event during the second millennium BC, at -1626. Therefore this date was tentatively connected with the Thera eruption as being the "supervolcano" of that period. Later, more growth depressions and "frost rings" were detected around the same time in various tree ring chronologies. 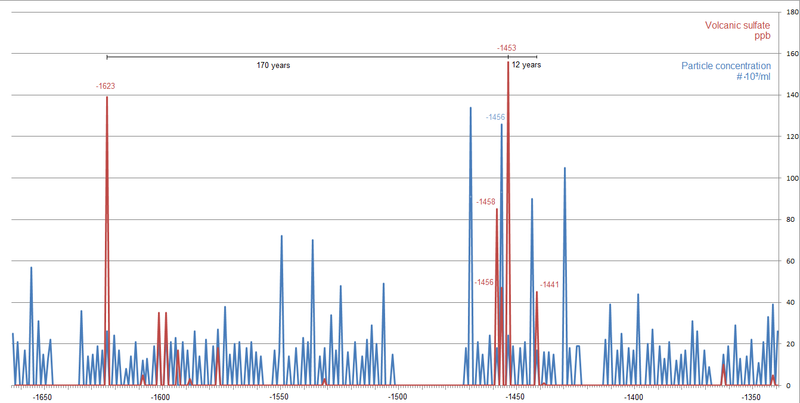 We can indeed see growth anomalies in pines from Northern Fennoscandia at -1648 and -1633. But were these growth depressions caused by volcanic eruptions? And is one of them really Thera? Salzer and Hughes (ref.6) carefully allow a wide possible range (-1675 to -1450) for the Thera eruption, but seem to prefer a date around -1626. A recent article by Helama et al. (ref.7) identifies sudden climatic downturns in the more than 7000 years long pine chronology from Northern Finland (which we have access to and which we have verified as being absolute and continuous). For the second millennium BC, two cold summer events are suggested as being caused by volcanic eruptions: at -1463 and -1583. For the period -1626 to -1622 no anomalous conditions could be found, and the events at -1648 and -1633 are apparently regarded as not severe enough. However, a second article (ref.8) considers also -1633 among the 20 most negative years for pine growth in Northern Fennoscandia, and excludes the downturn at -1583. Since then, this fatal calibration of the Greenland ice core time line has been abandoned and methods for unbiased counting of seasonal rings have been improved (ref.10). The new approach uses worldwide observed precise time markers generated by cosmic abrupt enrichment events (14C in tree-rings and 10Be in ice cores). After correction, the "79" volcanic marker former attributed to Vesuvius is now dated 88 and attributed to a volcanic source from the high latitudes. However, the ice core record for the second millennium BC is still awaiting refinement. Therefore the old ice core time line (Meese/Sowers timescale) is used in the following figure which shows volcanic sulfate and particle concentration (dust) measured in GISP2 for the period -1665 to -1340 (ref.11). Fig.1: Volcanic sulfate (ppb) and Particle concentration (#.10³/ml) for the period -1665 to -1340. GISP2 Greenland summit ice core. Click on the diagram to see details, go backwards one page to close the diagram. If the acid signal is indeed the result solely of the Aniakchak event, it should be noted, however, that no other major acidity signals in the Greenland ice cores conform with the 14C dating of the Minoan eruption. The prominent sulfate peaks are convincingly mirrored in the supra-long tree ring record from Fennoscandia, two growth downturns at -1633 and -1463 with exactly 170 years in between. There is a ten years offset between tree ring dates and ice core dates, probably due to the ice core counting error mentioned above. There is also a minor signal at -1452 in the tree rings corresponding to the small sulfate peak at -1441. This double signal (-1463 and -1452) has been discussed in ref.7. Fig.2: Fennoscandian Pine master (upper red normalised curve and lower green ring width curve). Tree growth downturns at -1633 and -1463 as identified in ref.8 are marked with a vertical ruler. A minor event at -1452 is also marked. A sudden climatic downturn is characterized by a sharp drop in ring width, the recovery from the blow takes a couple of years. Of course it is not possible to detect volcanic eruptions with astronomy, but as explained above the Thera eruption is archaeologically connected to the start of the Egyptian 18th dynasty and perhaps its first Pharaoh Ahmose. It is possible that in a certain time distance to the first regnal year of one of the later Pharaohs of that dynasty, Akhenaten, a rare total solar eclipse was observed, recorded and handed down on a still existing clay tablet. Using e.g. the established list of Pharaohs and their length of reign, we would be able to estimate the time between the eclipse, Akhenaten and Ahmose and reach a probable time range for the Thera eruption. Akhenaten was somewhat eccentric as he turned to monotheism, i.e. worship of the sun (Aten) as the only god. Dedicated to his new religion, he also built a completely new capital city - Akhetaten which means "Horizon of the Aten" - better known as Amarna. Amarna (and the new religion) was abandoned shortly after the Pharaoh's death, which means that the archaeological remains of the city provide a very narrow time frame (about 15 years) within a secure historical context. Fig.3: Map with positions of Amarna, Thera, Tyre and Ugarit. In the destroyed palace at Ugarit, another - charred - clay tablet was found with a report on a fairly recent event which possibly was a total solar eclipse. If the event reported by Abimilku would mark the final destruction of the palace at Ugarit and not a previous fire incident, we would have a chance to determine an absolute date for the eclipse and the Amarna period. This is because the archives at Ugarit were kept up to date and only contained documents of the recent half century, except for legal texts and treaties which were kept for longer time (ref.13). However, if Abimilku's report was about an earlier fire incident, we would have to use historical considerations to estimate the time distance between the eclipse and the Amarna period. Several scientists have tried to interpret the short text on the Ugarit clay tablet (KTU-1.78). All agree that it is about something that happened to the sun and her "attendant" (probably a star or planet) at new moon in a certain month, and that this was a bad omen. Most scientists (but not all) suggest a solar eclipse, because this would occur only at new moon. And as the "attendant of the sun" was visible, this hints at a dark sky and a total eclipse. The name of the attendant is given as "Rashap" and interpreted as the planet Mars. A crucial point is the name of the month "hiyaru", which is interpreted either as February/March, or April/May. There is also a dispute whether the eclipse occurred at daytime or at sunset. A modern reading of the clay tablet with interesting explanations is available in ref.14. Maybe it was not a solar eclipse at all, maybe the clay tablet just contains an astrological prophecy? Therefore it is misleading that the NASA Eclipse Web Site reports about the "Ugarit Eclipse" without reservation and gives a definitive date (3 May -1374), which is at risk to be wrong as we shall see below. But let's assume that the Ugarit clay tablet describes a real total solar eclipse. Sawyer and Stephenson (ref.15) identify 14 July -1405, 3 May -1374, 8 January -1339 and 5 March -1222 as possible candidates and finally they point out 3 May -1374 (the date reported on the NASA Eclipse Web Site). De Jong and van Soldt (ref.13) principally agree but prefer 5 March -1222 because they identify "hiyaru" as February/March, and because this is the only eclipse in the range during which the planet Mars was above the horizon (!). Not only that, but Mars was at this occasion only 3.5º from the center of the eclipsed sun at Ugarit. David Rohl (ref.16) reads the clay tablet as describing a sunset eclipse and therefore chooses 9 May -1011. Wayne Mitchell (ref.17, p.18-20) reviews the case and publishes sky views for these three suggestions (and two other candidates). Here we see the absence of Mars in -1374, Mars in the vicinity of the sun in -1222, and Mars between Jupiter and Mercury (triple conjunction) in -1011. The assumption that the final destruction of Ugarit was about contemporary with the Amarna period (case 1, refs.15, 16) has been disputed by other scholars (e.g. ref.18). The recent consensus places the first regnal year of Akhenaten about 150 years earlier than the fall of Ugarit (case 2). To calculate the start year of the Egyptian 18th dynasty, we estimate that the eclipse appeared within a fifty years period before the fall of Ugarit. Between Akhenaten's first year (-1350) and Ahmose's first year (-1548) there are 198 years according to recent consensus. With these conditions we arrive at alternative time ranges for the first regnal year of Ahmose, and the possible date for the Thera eruption should be within that range. The following table gives different eruption years for the three eclipse years suggested. In this table we see that the suggested dates for the Thera eruption for the first two eclipse candidates fall into the total range (for both case 1 and 2), but not into the range for either case 1 or 2. This is because the time distance between suggested eclipse and eruption is about 250 years, while the time distance between the fall of Ugarit and the first regnal year of Ahmose is either max. 200 years (case 1) or max. 350 years (case 2). Historical considerations will have to settle this question once the year for the Thera eruption has been identified by tephra analysis. Maybe Thera indeed exploded later during the Egyptian 18th dynasty, as suggested by Alexander MacGillivray (ref.19)? Our investigations of ice cores, tree ring chronologies and astronomy point out two probable dates for the Thera eruption within the range -1675 to -1450 (ref.6): -1633 and -1463. David Rohl's suggestion is apparently out of that range but could be considered later if the two other dates should prove negative. Ice core analysis provides indication for the volcanic nature of the events resulting in climatic downturns visible in the tree ring chronologies. It also provides the exciting conclusion that there are only these two candidates for a "supervolcano" eruption in the time range. Dendrochronology provides the exact dates and an estimate of the severity (impact on climate) of the events. Astronomy helps to verify these dates in their archaeological/historical context. The so far scientifically considered date for the Thera eruption is -1633, because this date is compatible with radiocarbon dates from archaeological context on Thera. However, this date is controversial as it implies a "high" chronology for ancient Egypt which is not accepted by all historians. Ice cores have been searched for volcanic ash in order to verify that its chemical composition is compatible with the Thera fallout in place, but no Thera fingerprint has been found yet. Moreover, the candidate for the Ugarit eclipse for this high eruption date does not match the eclipse report regarding an important detail: even though the "sun's attendant" has been identified as being Mars, that planet was not above the horizon during this occasion. The other possible date for the Thera eruption, -1463, has not been considered scientifically because it is not compatible with the radiocarbon dates from Thera. Moreover, it maybe would lower the conventional Egyptian chronology with about hundred years, resulting in a "very low" chronology. But there are some plus points for this date. For this alternative the planet Mars is only 3.5º from the center of the eclipsed sun at Ugarit. The volcanic sulfate peak is larger than in -1633, and preceded by a prominent dust peak. This matches the eruption sequence as identified by geologists, which includes a massive ash fall a considerable amount of time before the lava flow commenced. Maybe also the acid peaks three and five years before -1463 are from the same eruption, as archaeological investigations have shown that people got an early warning and abandoned the settlements before the final collapse of the island. In that case the volcano signal around -1463 would mark one of the largest eruptions during the last five thousand years, in size challenging even the Samalas eruption of 1258. For the time being we suggest to put aside the debatable and paralyzing radiocarbon dates connected to the Thera eruption, and we instead propose to focus on a tephra analysis in ice cores around -1463. There is a fair chance to find Thera here, especially as the possibilities already seem exhausted for the volcanic event around -1633. Except for the radiocarbon dates, the volcanic event around -1463 is the clearly better candidate for Thera because of better matching details. But the main reason why (in our opinion) -1463 is the better alternative, is its increased probability in connection with our postulated re-dating of Roman and classic Greek time. As we slide Roman and classic Greek cultures more than two hundred years towards our time, some sort of "vacuum" is generated behind the classic complex which easily could accommodate the civilizations of the Bronze Age with a "very low" chronology. 9. Vinther B.M.,Clausen H.B.,JohnsenS.J.,Rasmussen S.O.,Andersen K.K.,Buchardt S.L.,Dahl-Jensen D.,Seierstad I.K.,Siggaard-Andersen M.-L.,Steffensen J.P.,Svensson A.,Olsen J. & Heinemeier J. 2006. A synchronized dating of three Greenland ice cores throughout the Holocene. Journal of Geophysical Research, vol 111, D13102. 15. Stephenson, F.R. (1970). The earliest known record of a solar eclipse. Nature 228(5272):651-2. Sawyer J.F.A. & Stephenson F.R. (1970). Literary and astronomical evidence for a total eclipse of the sun observed in ancient Ugarit on 3 May 1375 b.c. Bulletin of the School of Oriental and African Studies 33(03):467 - 489. 16. Rohl, D. (1995). A Test of Time: The Bible - from Myth to History. London: Century. ISBN 0-7126-5913-7. Note: A pdf-version of this article (for easy printing, saving and citing) is available on ResearchGate (DOI: 10.13140/RG.2.1.4942.1287). The pdf-version features an abstract and acknowledgements.